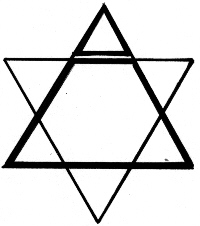 Down through the centuries the Jews have always been recognised by the frequent use of their own unique distinguishing mark, that of the two interlacing triangles. However, most Jews do not have the faintest idea of the true Cabalistic meaning of this symbol and its widespread use amongst the higher initiates within all the Luciferian and Freemasonry sects. This most occult of all symbols is worn as a charm by countless Christians who naively believe that it is a harmless token representing the chosen people of God, and hope that it will bring a kind of blessing on themselves. However the exact opposite is the case; this symbol especially, brings with it powerful curses, leading to spiritual and moral degeneration and physical sickness with continued use. These symbols when worn or displayed by high initiates or "the profane" alike, evoke the same powerful forces within the supernatural realm. The following extracts by Warren Weston, at the time the world's foremost authority on Gnostic and other sects, demonstrates the phallic nature of the so-called "Star of David" or "Solomon's Seal" more correctly called the "Double Divinity," outlining its esoteric occult history. Their phallic God is therefore hermaphroditic or bi-sexual. The sexual organs are considered sacred, while the rites and rituals are designed to liberate the passions and the natural instincts from the control of (wait for it) reason. The novice must denounce as fraud the existence of a moral order, together with that of its creator. This is the exact reverse of what the Bible stands for. The creation of the universe (according to the phallic adepts) is the work of the hermaphrodite god. The universe was not created but procreated or engendered by him in successive stages. The god himself is supposed to have been the original and unique emanation of the divine substance of which all things are made. In this role the god is known as Pan, the first principle of nature. Thus man is placed on a par with his creator: both are divine and immortal; man therefore creates when he procreates. No doctrine was ever better designed to destroy reason by self conceit and to degenerate man into lust and crime. Man is attracted to magic by the notion of "getting something for nothing" of the "secret heritage," as opposed to the idea of earning an honest living. Magic appeals to man's baser nature, to his greed and his appetite, most of all to his ego. 1. The magic mirror flatters the ego, by making him believe that he's on a par with God . . . (now where have we heard that before? . . .) At the same time, it distorts his outlook; leads him to reject reason, and to accept nonreason and hypocrisy in its place. Vice becomes virtue. Man becomes the slave of his own ego. 2. The person becomes part of a secret society (whether he knows it, wants it, or not), held together by a common hatred, depravity, and greed. It is one of the thousand or so occult fraternities which secretly worship the phallic god and practice magic for their own ends. These fraternities, which are the plague of humanity, have always exploited religion as a screen for these activities. Good old paganism, in all its forms! The Pyramid represents the conspiracy for the total destruction of Christianity and the establishment of a "One World Government," the big "secret" of the Order. The eye radiating in all directions from the capstone is not the all-seeing eye as we would suppose, but the all "spying" eye that symbolises the terrorist, Big Brother-like agency, that Weishaupt set up under the name of "Insinuating Brethren," to guard the "secret" of the Order and to terrorise the populace into the acceptance of its rule. This "Ogpu" (Gestapo-like system) had its first workout in the Reign of Terror during the French Revolution, which it was instrumental in organising. The words "ANNUIT COEPTIS" means "our enterprise (conspiracy) has been crowned with success." 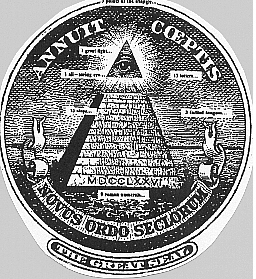 Below, the words "NOVUS ORDO SECLORUM" explains the nature of the enterprise and means "a New Social Order." It should be noted that this insignia acquired Masonic significance only after the merger of that Order with the Order of Illuminati at the Congress of Wilhemsbad, in 1782. 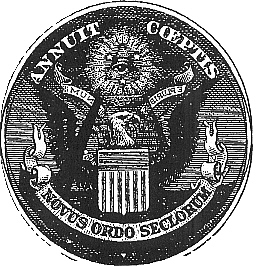 Benjamin Franklin, John Adams (a Roosevelt kinsman) and Thomas Jefferson, all ardent Illuminists, and defenders of Adam Weishaupt, proposed that this insignia be commissioned as the reverse of the seal, on the face of which was to be the eagle symbol, which was subsequently adopted on June 10, 1782. Upon adoption of the Constitution, Congress decreed by Act, of September 15, 1789, its retention and official seal of the United States Government. It is stated, interestingly enough, by the State Department in its latest publication on the subject, that "the reverse has never been cut and used as a seal" and that only the obverse bearing the eagle symbol has been used as an official seal and coat of arms. It was first published on the reverse of all dollar bills at the beginning of the Roosevelt "New Deal" in 1933. Figure 5: Illustrates the present official Seal of the United States. In the top right hand corner is the original thirteen star cluster as submitted by the designer C.L. Totten, originally featuring a cross incorporated within the Constellation in the crest. Interestingly enough, this design was subsequently changed to a cluster resembling a Star of David, which was ultimately approved and ratified by Congress. Figure 6: Illustrates another interesting result when the great seal is overlaid with the Illuminati Crest. Note carefully how the eye in the triangle symbol matches perfectly with the centroid of the stars within the crest. The incredible consistency of it all has to be marveled at. . . .So what is the meaning of the publication of this symbol (Fig. 4) that had been so carefully suppressed up to that date that so few Americans knew of its existence, other than as a Masonic symbol? It can only mean one thing, that with the advent of the New Deal, the Illuminist-Socialist-Communist conspirators, ardent followers of Professor Weishaupt, regarded their followers as beginning to be crowned with success. 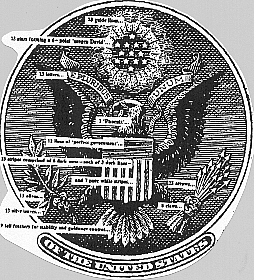 In effect this seal proclaims to the people of the United States, that the entire power of their Government supports the conspiracy to undermine and destroy them and the Constitution on which it rests - proving that it is a Government of Traitors. Is this then the reason why successive administrations within the White House have so staunchly supported the state of Israel, both financially and militarily? ". . .To the crowd we must say: we worship a God, but it is a God one adores without superstition. To you, Sovereign Grand Inspectors General, we say this, you may repeat it only to the brethren of the 32nd, 31st and 30th degrees: The Masonic religion should be, by all of us initiates of the high degrees, maintained in the purity of the Luciferian doctrine. If Lucifer were not God, would Adonay (the God of the Christians) whose deeds prove his cruelty, perfidy and hatred of man, his barbarism and repulsion for science, would Adonay and his priests calumniate him. Yes! Lucifer is God, and unfortunately Adonay is also God. . . .religious philosophy in its purity and truth consists in the belief in Lucifer, the equal of Adonay." Most Masonic Lodge Symbols contain only two or three primary elements, with slight variations depending on the particular sect. If you look closely, you will see that the compass and square here is a disguised form of two interlaced triangles, with some lodges bold enough to display the symbol outright. Also, many commonly used company logos are represented by graphical forms of 666, which are easily spotted once you know what to look for. The Mitsubishi symbol, for example, is a classic. Three pairs of diamonds in a triangulate form. Below is a copy of the sworn oath of the Illuminati. It is interesting to compare the renunciation of vows portion of the oath with that of the Jewish Kol Nidre, which absolves the Jew yearly from any legally undertaken oath, whether it be a Judge, Magistrate, Lawyer, Doctor or whatever. "The star of the microcosm, or the MAGIC PENTAGRAM, that star wherein the human figure was represented by Agrippa, with the head in the ascenidng point and the four members in the four other points--the Burning STAR, WHICH, WHEN INVERTED, IS THE HIEROGLYPHIC SIGN OF THE GOAT OF BLACK MAGIC, whose head can then be sketched in the star with the two horns above, the ears on the right and left, and the beard below, sign of antagonism and blind fatality, the goat of lewdness assaulting heaven with its horns, a sign execrated even in the Sabbath by initiates of a superior order. . . In 1991 the town of Wroughton had been having its own share of excitement. During the night of July 16th the whole town suddenly found itself electricity-free. At the same time, country residents around the nearby Neolithic hill fort of Barbury Castle had witnessed the by-now usual aerobatic display of small, brightly colored flying objects, followed by what many described as a low rumbling noise akin to that heard at Alton Barnes the previous year. Next morning the headlines in the British press read 'NOW EXPLAIN THIS ONE'. This pattern is one of the most important alchemical and Hermetic symbols. It is featured in Michespacher's 1654 book Cabala in Alchymia as the diagram describing the very process of Creation. The three balls are said to represent the three alchemical elements- salt, sulphur and mercury, in conjunction with the Godhead at the center which unites the three to create the Universe; in other words, the three elements are spun together and held in equilibrium until an energy from the Creator activates the process. This is the act of material manifestation. The diagram is also well known to Qabbalists and Rosicrucians whose roots can be traced back to the ancient Egyptian mystery schools. Their description tallies with Michespacher's, but because the source is older it is inevitably devoid of centuries of misinterpretation. The alchemical connotations which were fashionable in the Middle Ages are here replaced by water, fire and light respectively. These are contained by the triangle of complete equality (equilibrium), which in turn interacts with the three circles of the high throne - Father, Son and Spirit, the three sources of Light, also referred to as the Three In One. Generated by this diagram are the seven creative spirits; from this master plan evolves the true nature of the solar system. The principle of Three in One is in itself a cosmic law. But as John Michell discovered, the whole structure is also a collection of numeric, musical and geometrical harmonies which founded the prevailing order in every old civilization: "It demonstrates the principle of Three in One by means of a central circle which exactly contains the combined areas of the three circles around it. Moreover, the sum of all the four circular areas in the diagram is 31680 square feet. . . In traditional cosmology, this was taken to be the measure around the sub-lunary world, and the early Christian scholars calculated the number 3168 as emblematic of Lord Jesus Christ. The same number was previously applied to the name of a leading principle in the pagan religion." Michell further explores this number: 316.8 as the number of feet in the circumference of the lintel ring at Stonehenge and the perimeter square of St. Mary's Chapel in Glastonbury, which relates to the 31680 miles of the perimeter square around the Earth or the number of furlongs of its mean radius. Michell further wrote, "The number 3168 is superabundant, the Pythagorean term for a number which is exceeded by the sum of its factors. The sum of all the numbers which divide into 3168 is 6660, connecting the number of the Lord Jesus Christ with that of the Beast of Revelation." To Michell the Barbury Castle tetrahedron is nothing short of "a divine revelation."